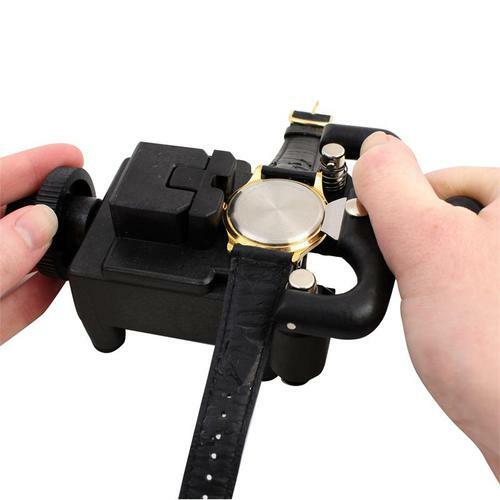 Opening a watch back is pretty easy, you just need to identify what kind of watch case back you have and then get the right tools to open it. In this article, we will be addressing how to open a snap off case back. 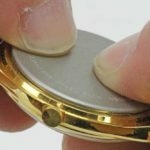 You can tell that a watch case back is a snap off by looking at the back: if it has a small gap or indentation in the case back where a pry tool could fit in between the back and the case, that is a strong indication it is a snap off case back watch. 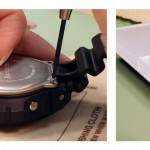 Before you start, you may need to remove the watch band so that your tools can fit on the watch back. 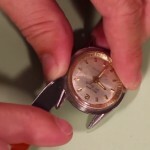 Read this article on How to Remove your Watch Band for help. Take the watch case in your hand and find the notch or tab that will help you pry the back off. It may just be a slight cut or indentation so you might want to use an eye loupe or other magnifier to help you find it. 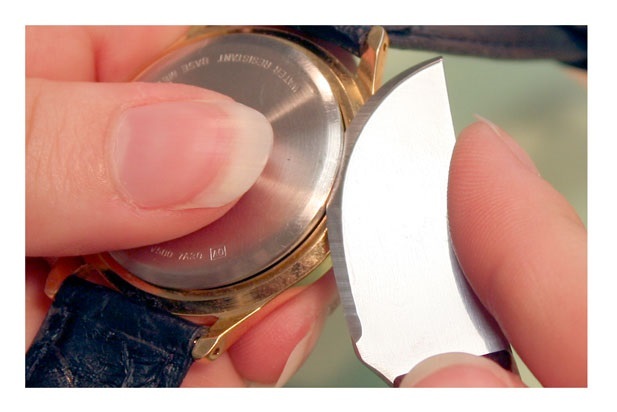 Once you have identified the indent or tab, turn the watch case so it will be easily accessible and slide your bench knife’s blade under the tab with your other hand. under the watch case tab. Be careful not to let the blade slip because it could damage the watch or cut your hand. With your efforts, the back should easily pop off the watch, and when it does you can lift it off with your fingers. Now you are ready work on the inside of the watch. 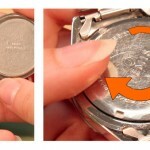 When your repair work is completed, check out How to Close a Snap Off Case Back to close the watch. If there is no indication of these, it could be another design that is opened by a different method. 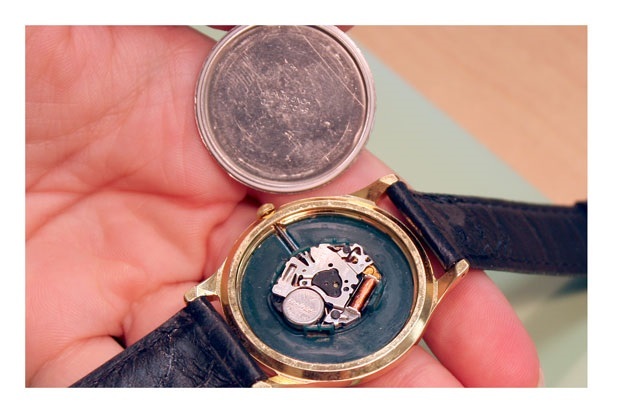 There are many mechanical ways that watch backs are designed to open. I am sorry but we do not have a guide on how to open every mechanical design watch back. It is actually more complex and extensive than you might think. Here is an overview of the most common backs and how to open them. Thanks! Actually, there are many designed that open through the front of the watch (not the back). But on Chinese GuanQin watches the watch back is oressed in with insane force. On one watch the first knife blade broke in full length when trying to pry the watch open. Needless to say the lid would not want to be pressed back in place after reparing the watch. I tried all known tricks, including freezing the lid down to -20C to shrink it . it would not snap back in place. When eventually using a press tool the front crystal shattered due to the extreme forces needed. Currently I am facing the very same situation once more, again on a Chinese mechanical GuanQin watch. Not sure what trickery they use on their cases. Unfortunately these watches are about the worst when it comes to misaligned hour/minute hands and horrible speed adjustment by the factory, so they MUST be opened. I never saw the advantage of pressed backs over screw backs – the latter can be easily handled. 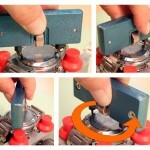 and create a good controllable pressure on the seal for water resistance.